Step 1: Start with a Magic Ring cast on. If you need a refresher on that, try this video tutorial. Step 2: Make 6 sc in the ring, pull it closed, and slip st to join. Step 5: That slip stitch counts as 1st st in this round. Hdc & 2 dc in next st, 3 dc in next st, dc & hdc in next st, hdc in each of next 3 sts, dc & tc in next st, tc in next st. You’re now half-way around. Step 6: Ch 1, tc in next st, tc & dc in next st, hdc in each of next 3 sts, hdc & dc in next st, 3 dc in next st, 2 dc & hdc in next st, slip st in next st; slip st to the 1st slip st made in this round to join. 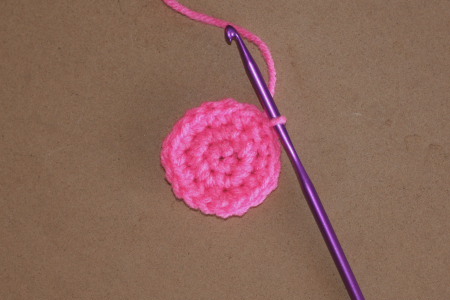 Step 7: Add an “outline” round. Change to new color, slip st & ch 1 in each st and repeat to the end. Slip st to the 1st slip st made in this round to join. And you’re done. They are fast and easy. 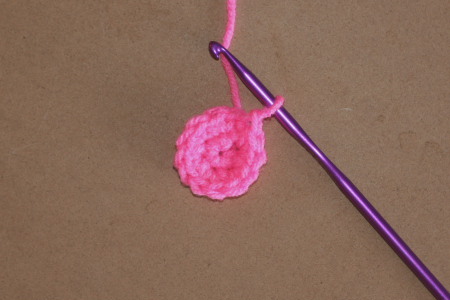 You’ll probably spend more time sewing in the ends than in the actual crocheting. Cast on with a Magic Ring. Rnd 4: last slip st counts as 1st st in this round; hdc & 2 dc in next st, 3 dc in next st, dc & hdc in next st, hdc in each of next 3 sts, dc & tc in next st, tc in next st (HALF MADE). Ch 1, tc in next st, tc & dc in next st, hdc in each of next 3 sts, hdc & dc in next st, 3 dc in next st, 2 dc & hdc in next st, slip st in next st; slip st to the 1st slip st made in this round to join. 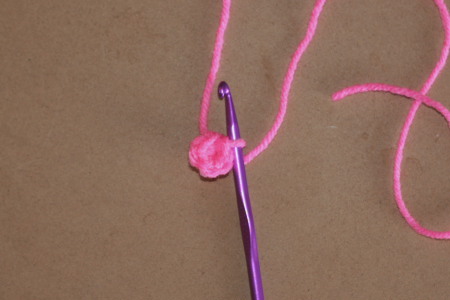 Rnd 5: change to new color, slip stitch & ch 1 in each st, slip st to the 1st slip st made in this round to join. Prisoners, Poverty and Picking Oakum → ← Never Fear, The Yarn Wranglers Are Here! 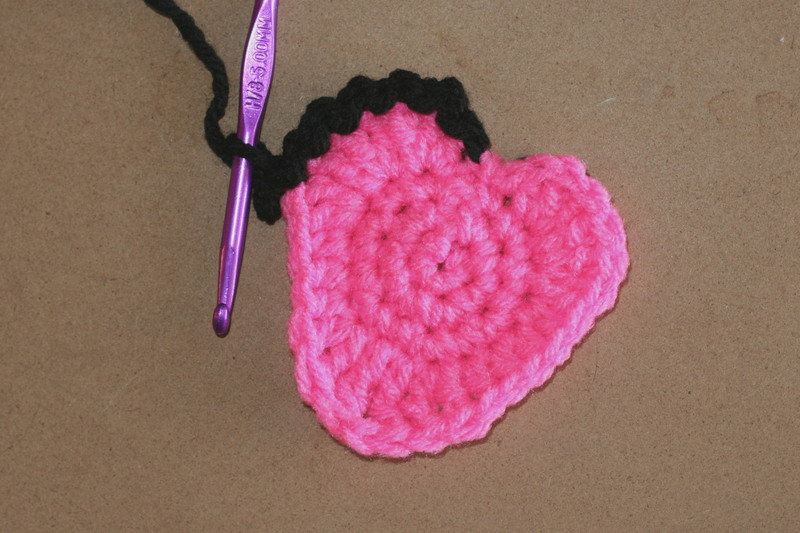 10 Comments on "How To Crochet a Heart"
That is an interesting project. Thanks for sharing; I hadn’t heard of it. And I’m happy to toss my heart out there for the world. 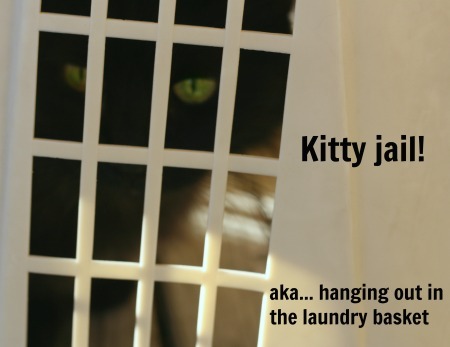 (haha) The internet can’t have too many bad cat videos or too many crochet tutorials. Oooh I love it. So quick and easy one could get buried in hearts! Thank you. If I haven’t said it before, your tutorials are the best. Thanks! 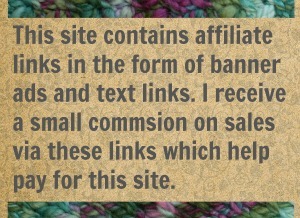 I do appreciate that and I hope they are useful. I admit to spending a ridiculous amount of time thinking about the best way to teach something on line. Just beautiful, and I shared!! These are cute! 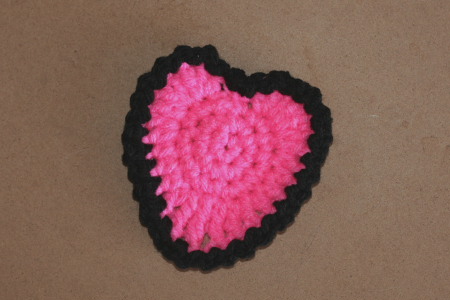 Okay, Jenn, I’ll try your heart pattern, but I refuse to become buried in hearts. 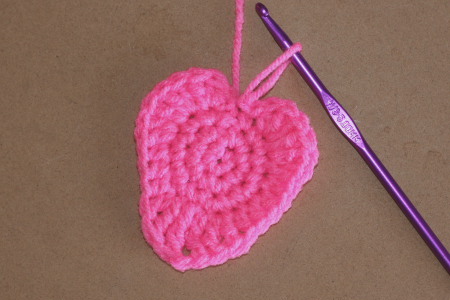 Just let me make another in this pink yarn, then maybe another in that red yarn… And maybe that sparkly puple yarn would make a cute heart, too… Ooo, there’s some burgundy! Yeah, I refuse to become buried in them. I know exactly how that goes. But there are worse things to get addicted to than makign pretty hearts. And you are a generous soul so I know that if you make 74 hearts this week, there will be 74 happy recipients of said hearts in the world. So hook on! Now you’ve done it. Don’t know where it came from, but just found some Thick & Quick in dark red. And white. Hmm, add an extra row to each heart, four would make a rug, right? So my poor tootsies wouldn’t hit cold floor in the morning? That might work! And I take total responsibility for this new project of yours. yes I put that yarn in your stash when you were not looking. Why wouldn’t I? 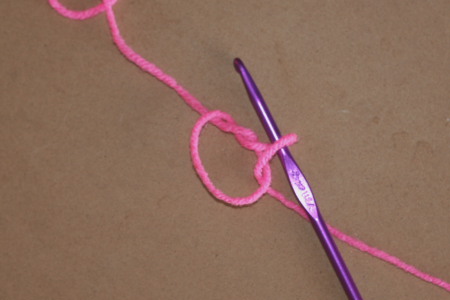 I swear someone breaks in to my home and leaves yarn so I just pass that on. I’d add the extra row at the end. 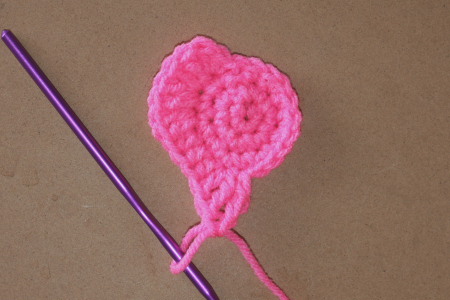 If you add it at the beginning it would mess up the stitch count and teh number of increases you need to get around the heart.